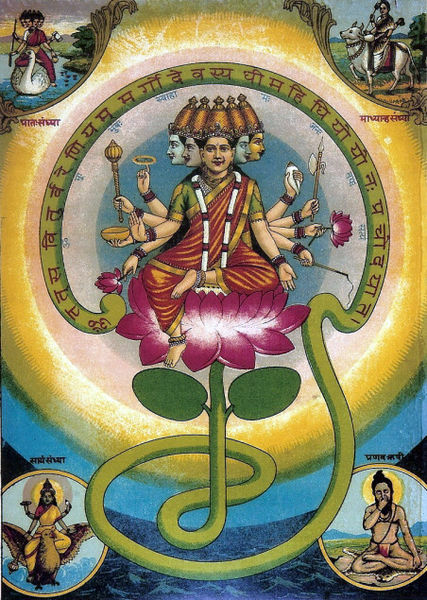 As the Upanishads gained prominence and pushed towards philosophical monism, for Brahman beyond even the personification of Brahma, the Hindu tradition simultaneously gathered theistic traditions together in the great epics. These tails tied many gods together along with Hindu traditional law and philosophical teachings of the Upanishads. This is why these texts have such a key role in Hinduism, providing the teachings and morals in a narrative and memorable form. The Ramayana is a story of Rama, incarnation of Vishnu, and his quest with Hanuman, the monkey god, to rescue his wife Sita from the demon Ravana. In the beginning of the story, Ravana is a demon but also a sage devoted to Shiva who meditates for an impossibly long time and grows nine other heads that give him all the magical powers in the world. Having obtained everything achievable, he decides to end his existence and proceeds to cut off one head at a time and throw them into a fire. 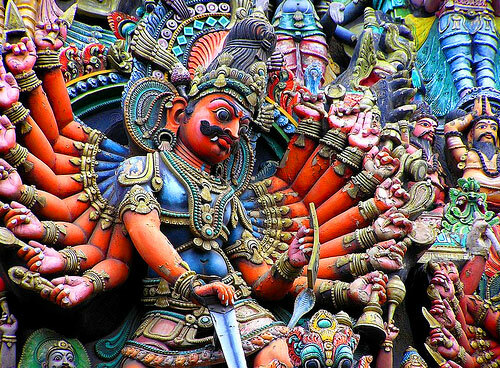 Just as he is about to cut his original and final throat, Brahma appears and says that he will grant Ravana whatever he desires, and Ravana asks to never be killed by gods, spirits or demons. Brahma grants this, and from this moment on Ravana is the villain of the story. The first thing Ravana does is go to Shiva, who is portrayed as stoned on bhang (milk steeped in pot), and demand Shiva, the destroyer, submit to him. 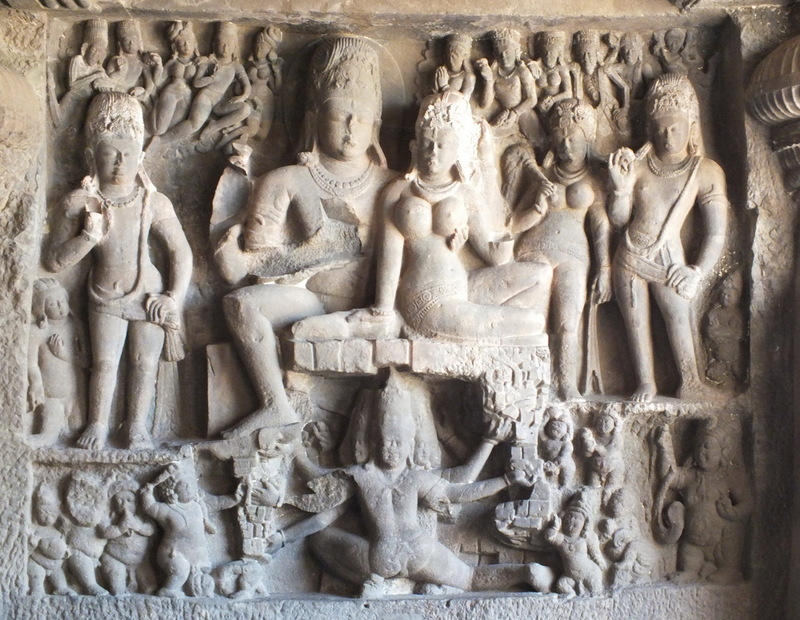 Shiva responds by lifting a finger and imprisoning Ravana in stone for thousands of years. When Ravana finally breaks free he is quite pissed. Vishnu decides to be incarnated as Rama so that Ravana can be killed by a mortal human. After Ravana’s sister tries to seduce Rama and Ravana’s brother leads an army of demons against Rama and is slain, Ravana decides to kidnap Sita, Rama’s wife. There is an underlying theme of woman as desire and the instigator of conflict. 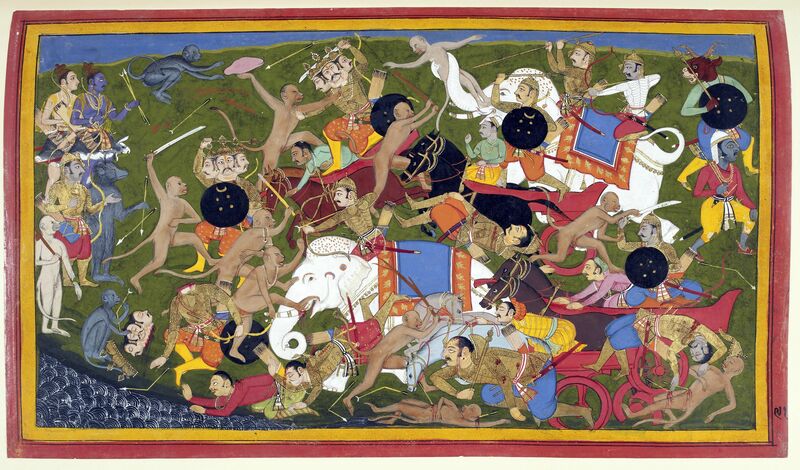 Ravana is drawn against Rama by his sister, and Rama is drawn against Ravana by his wife. 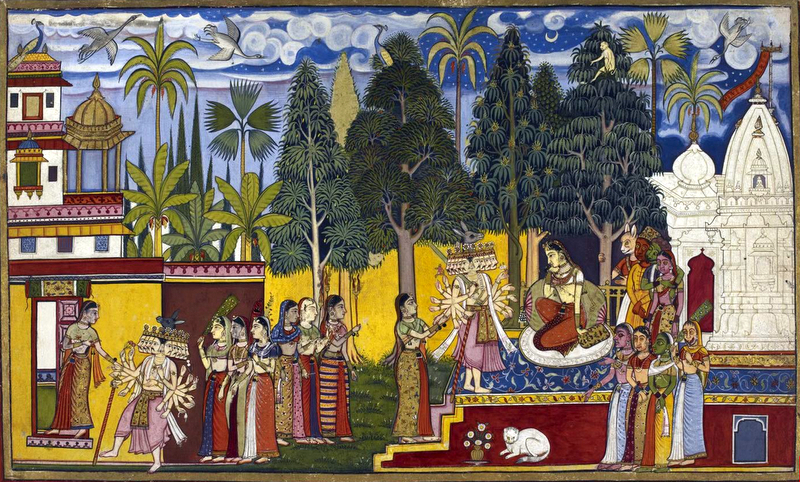 Later in the story, when Rama is following Brahma and his consort goddess Gayatri through the jungle, and as the goddess sways as she walks Rama (who is, of course, identical with Brahma not only as an individual but an incarnation of a central god himself) catches glimpses of Brahma. This is clearly symbolizing desire as in motion (as the hips of a goddess), and even though it too is one with all you can see glimpses of the All amidst and beyond the motions of desire which get in the way. This does, unfortunately, fit with the ancient cosmological view that women are of the earth, and of the body, emotion and desire, and men are of the sky, on top of woman, and of the mind, reason and putting desire in check. This does place men above women, as well as suggest that women are not rational because they are emotional, which is not so egalitarian. Philosophers such as Hume and Nietzsche argue that thought is always driven by emotion and desire, for both men and women, and psychologists tell us that men are just as emotional as women, but women tend to be more expressive of emotion and men tend to conceal emotion, particularly in conflict. On his way to free Sita, Rama and his brother Lakshmana meet Hanuman, the monkey god. Monkeys, like women, are often symbolic of desire and attachment, the lower part of human nature. One exception to this are the baboons of Thoth, ancient Egyptian god of knowledge, who symbolize intelligence and inquiry. Monkeys, like people, are full of desire and tend to get into everything. We will soon cover the Buddhist concept of the monkey mind, leaping from thing to thing searching for satisfaction. The idea is not to eliminate desire, but to put it in check by reason, as mentioned, and so Hanuman serves Rama through the course of the story and helps him to rescue Sita after Rama helps Hanuman reconquer his monkey kingdom. Note that without Hanuman, without desire, Rama could not put things right again. 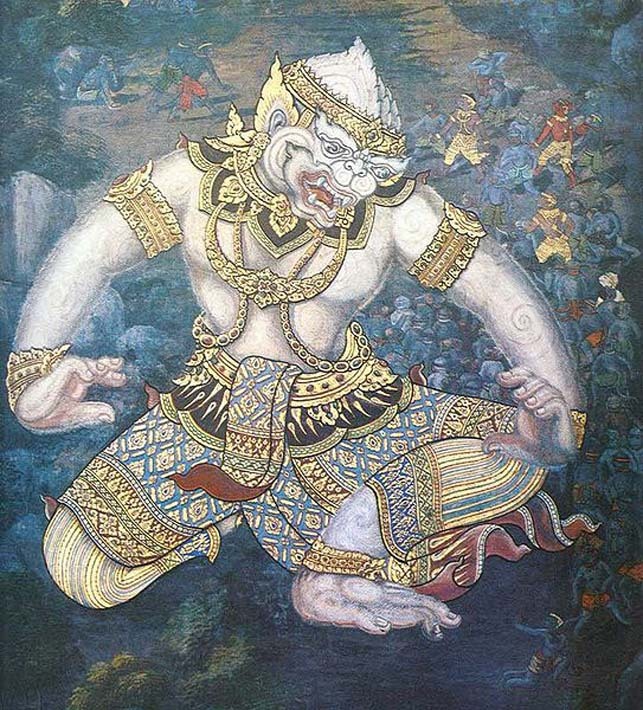 Hanuman sends out search parties as king of the monkeys, and the team he sends to the south discovers that Sita has been taken to Sri Lanka, the large island south of India, where Ravana rules as king. After the armies of Rama and Ravana clash, and Ravana is slain, Rama returns home with Sita. The Mahabharata is incredibly long. It is almost two million words, ten times the length of the Odyssey and the Iliad, the two Greek Epics of Homer, combined. 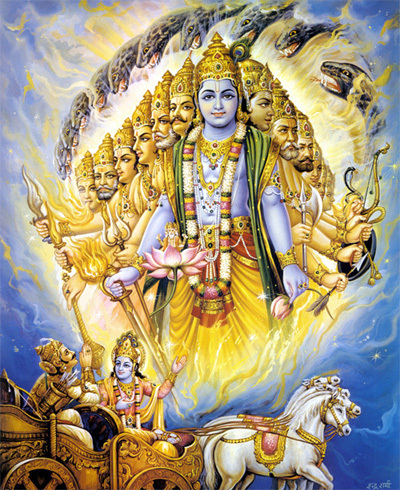 The central and most celebrated part of the Mahabharata is the Bhagavadgita, the story of crown prince Arjuna hesitating before fighting a civil war against his family and former friends and teachers, and then being counseled by Krishna as an incarnation of Vishnu that as a warrior it is Arjuna’s duty to fight the just fight even if is against everyone else. Along the way, Krishna explains Hindu doctrines of past lives, karma, liberation, the caste system, and duty. In the peak moment of the story, Krishna reveals his true self to Arjuna, which is so dazzling, complex and monstrous that Arjuna trembles with fright. Krishna teaches Arjuna that if you do your duty not for yourself but for the cosmos, you are free of doubt and death, and that the cosmos is far beyond human understanding.